The Joint: The Old Salty Dog, 1601 Ken Thompson Parkway, Sarasota, Florida 34236. You can view their website by clicking here. The Vibe: The Old Salty Dog started life as a beer and hot dog stand back in 1986 and now boasts two prime locations in South West Florida. 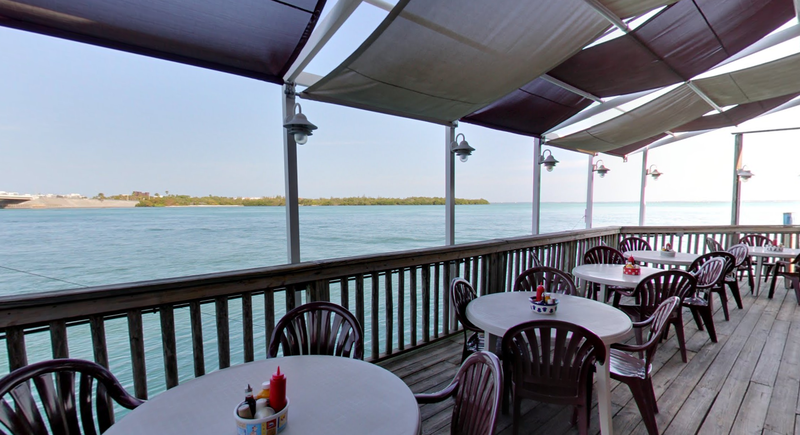 Their City Island joint is perched on the shores of Sarasota Bay and is just yards from the Mote Aquarium, famous for it’s manatee preservation. It’s a blissfully quiet place to spend a sunny afternoon. The views across the Bay are a big selling point and as we soak up the atmosphere we see a steady stream of expensive yachts mixed with lowly fishing boats passing by. Much like our trip to Yoder’s we learned about the Old Salty Dog from it’s appearance on Man vs. Food. Adam visits the joint to sample their signature dish, The Salty Dog, and we weren’t letting this one slip away from us. This is a beer battered hot dog served with an impressive choice of toppings and a side of fries. We’re big bacon and cheese fans so loaded ours up with some crispy bacon and some classic american sliced cheese. Our food arrives whilst we’re watching the neighbouring pelicans and we grab a first bite. It’s crunchy, full of flavour, and really indulgent. English readers will be familiar with the battered sausage but possibly not in a sweet bun with added toppings, and it’s those great strips of bacon and melted cheese that top the scales here. The fries could do with some added life but they fill you up so we’re not complaining. 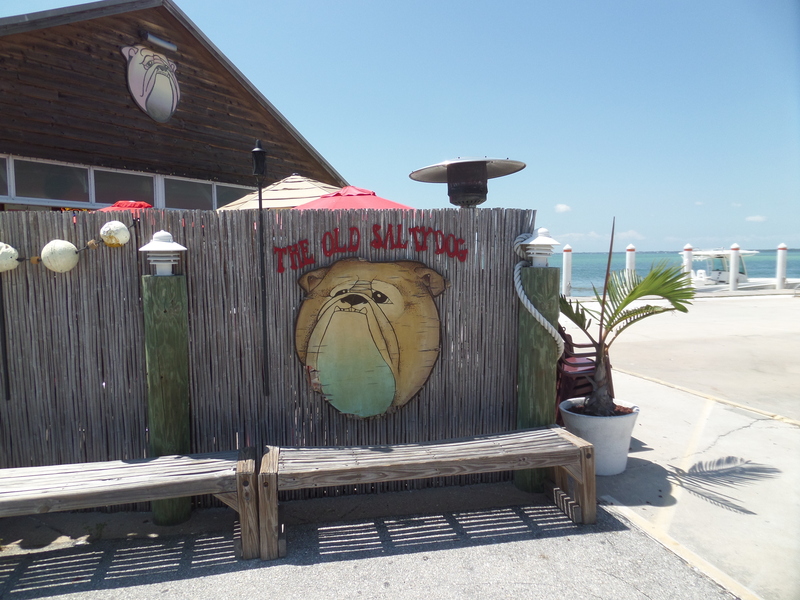 The Old Salty Dog serves up tasty treats with a great view, two key ingredients for a good lunchtime. We can’t wait to go back. The Price: $8 for the Salty Dog with $1 for the extra bacon and 60 cents for the extra cheese. The Old Salty Dog was visited by Tom in June 2014. 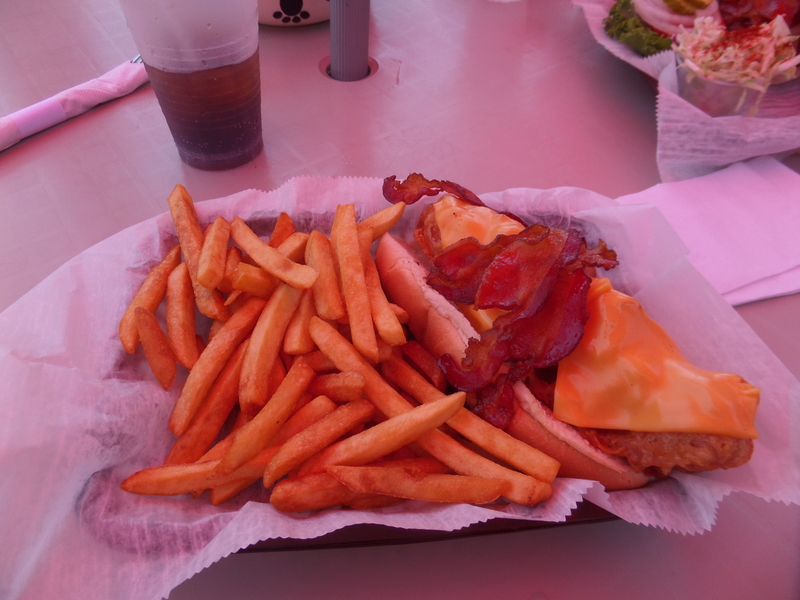 Posted in Florida, SarasotaTagged bacon, battered sausage, cheese, city island, florida, fries, Hot dog, hot dogs, ken thompson parkway, mote aquarium, old salty dog, ringling, Salty Dog, sarasota, sarasota bay, siesta key, south west floridaBookmark the permalink.